Emerson Sensi Review: Is This Thermostat The Sensible Smart Solution? / Emerson Sensi Review: Is This Thermostat The Sensible Smart Solution? So, you’re looking to join the craze and buy a smart thermostat? The Emerson Sensi WiFi thermostat is a sensible option that has a lot going for it. It has a more traditional look when compared to the shinier more in your face designs of some other thermostats. In fact, if you didn’t know any better, you might confuse the Sensi with a mere humble, unconnected, programmable thermostat. However, I assure you the Sensi IS a WiFi thermostat and it DOES boast some nice smart features. Read this review and I’ll do my best to enlighten you! Or don’t, and start shopping right now with the link below. 3 With Or Without A C-Wire? 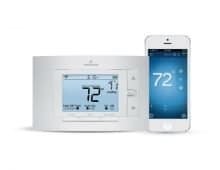 What makes a smart thermostat smart is its ability to keep you comfortable and save energy at the same time. Let’s take a look at some of the features that Sensi uses to try to accomplish this. 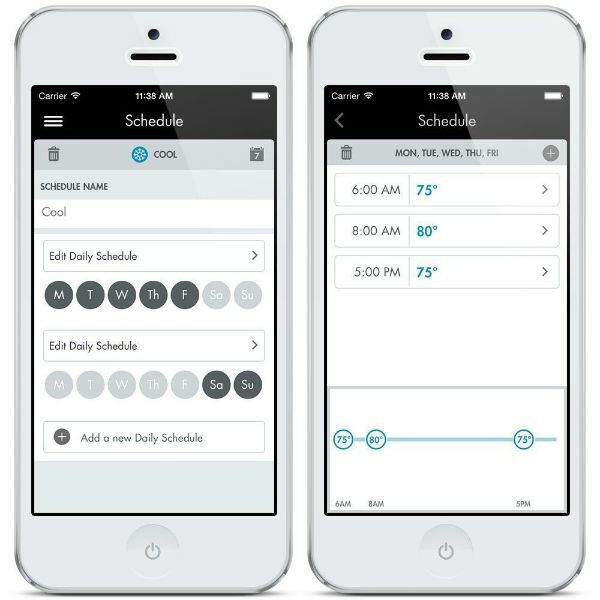 The most basic and necessary feature of any smart thermostat is the ability to create a schedule. One of the biggest complaints about the programmable thermostats of the recent past is how big of a pain it is to actually program them. The Sensi app takes away this pain. It enables you to easily set up a weekly schedule. You can set up a weekday and a weekend schedule or you can customize each day. You can also make and save multiple schedules. For example, if you work rotating shifts, you may set up a schedule for each shift. Or, you may make a vacation schedule that saves as much energy as possible while you are gone. It really is intuitive and easy to use. The cycle rate determines how much the temperature will change before your thermostat tells the heating/cooling unit to kick in. For example, if your set point is 72 F and your cycle rate is 2 F, the heat won’t kick in until the temperature reaches 70 F.
The Sensi doesn’t allow you to choose a specific number of degrees for your cycle rate. Instead, you simply choose between “Slow”, “Medium”, and “Fast”. A slow cycle rate will cause your temperature to fluctuate more but keep your equipment from frequently turning on and off. It is recommended that people with boiler type systems use the slow setting. A fast cycle rate will keep a more consistent temperature, but will require your equipment to cycle on and off much more. This feature is the Sensi’s way of making sure you don’t freeze on your way to the kitchen for your morning coffee. If you schedule your heat to turn up from a 65 F overnight set point to 70 F at 7 am, Early Start will turn on your heat before 7am so that by the time 7am is here, the temperature is already 70 F. Then, you can safely get out of bed without the fear of the chilly night air. The typical way to do this with the old programmable thermostats was just to set all the schedules to change sooner. The new way is better. Just set the schedule exactly as you want it and the Sensi thermostat figures out the rest. It’s called a smart thermostat for a reason! The Boost feature is intended for those of you that have systems with multiple heating or cooling stages. The most common type of system that qualifies here will be a heat pump with an auxiliary heat source. So if that’s you, listen up! If there is a temperature difference of more than 3 degrees, turning the boost on will activate all available stages to reach the target temperature as quickly as possible to keep you comfortable. Turn the boost off, and the Sensi will revert to using the most efficient means to maintain the temperature. All your Sensi thermostats can be controlled from the convenience of a single app on your mobile phone. Whether you own multiple homes, a business, or some rental properties, the Sensi will empower you. 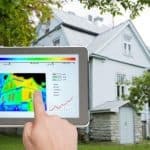 You will have the ability to monitor and adjust the energy use of each property right at your fingertips. Maybe you have a curious youngster that developed a new “random button pressing” hobby. Or maybe you have some rental properties whose temperature you want complete control of. Either way, the keypad lockout feature of the Sensi gives you what you want. It locks the screen on the thermostat unit so that no changes can be made from there. But, it allows you to maintain complete control of the thermostat via the mobile app. A search for this thermostat will reveal two different model numbers for the Sensi thermostat and it turns out, they are the SAME thermostat. The difference is in the packaging and instructions. One is meant for professional installers (1F86U-42WF), and the other is meant for the retail consumer (UP500W). Both versions are listed on the same Amazon page. Just choose whichever one is cheaper! With Or Without A C-Wire? The manufacturer claims this thermostat can be installed without a c-wire. Other reviewers have even recommended this is the thermostat to get if you don’t have a c-wire. I don’t recommend it. Notice the wording here implies that connection and battery life are less than optimal without the c-wire. Many people without a c-wire have ended up experiencing connectivity problems. 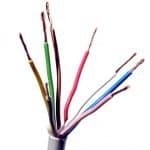 The unexpected loss of connection at seemingly random intervals can be an extremely frustrating problem. The other drawback to not having a c-wire is the Sensi will be relying on its 2 AA backup batteries much more often. Some users have even reported having to replace batteries every couple weeks. What a pain! There are a couple solutions available to add a c-wire if you don’t already have one. If you want to get a WiFi thermostat, I strongly recommend it. Integration with Wink makes it even easier to control your thermostat. 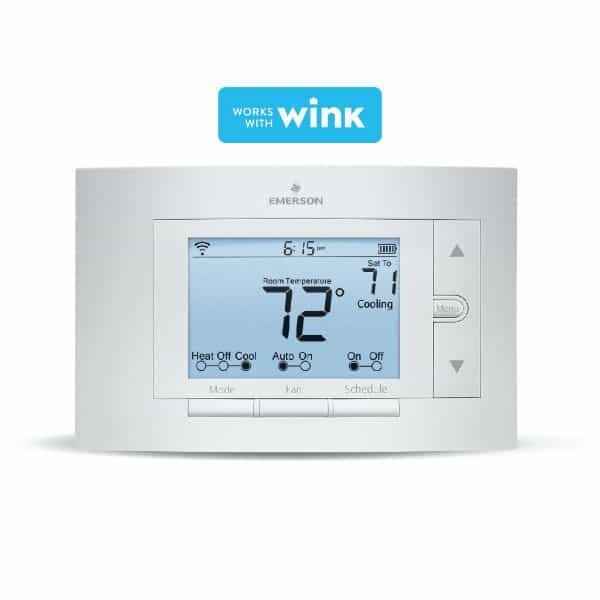 Using the free Wink app, you can control all your Wink supported devices including your Sensi thermostat from one easy to use app. For even more advanced control, you can purchase the Wink hub. The hub makes it possible for all your Wink devices to speak to each other. From there, you can set up custom rules to create a more automated experience. Integration with Amazon Echo lets you control your Sensi with your voice. It can currently respond to voice commands to either set the thermostat to a specific temperature or, to raise or lower the temperature by x degrees. You cannot connect directly to your Sensi thermostat using your local WiFi network. It requires that you connect indirectly by going through the cloud-based Sensi server. That means if for some reason the Sensi server goes down, you will not be able to connect to your thermostat. If that does happen, the thermostat will continue to run as it was programmed, but you will lose the ability to make any changes from the app. Fan control with the Sensi is less than what I would expect for a smart thermostat. The only options it has is auto or on. “Auto” means that the fan only comes on when the heat or AC comes on. The “on” option means that the fan runs all the time. I almost never want to run the fan constantly, but there are many times where the heat or AC doesn’t run often enough to keep my place properly ventilated. I would like to see an option that turns the fan on for x amount of minutes per hour for ventilation purposes. There are many other thermostats that have this feature. It seems to me that it would be something relatively easy to add as a software update. Setting up an account can only be done through the mobile app. So, if you wish to manage your thermostat remotely whether it be via the web or via the app, you will first need to get the app. The Sensi server in the cloud gets all the data about when your equipment turns on and off. But, there aren’t any usage reports/data available to the user. Perhaps this is a maybe someday feature, but the Sensi has been on the market for several years so I’m not holding my breath. Sensi is the sensible solution to the smart home thermostat. 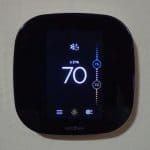 I am of the belief that a smart thermostat is a great “first smart device” to buy and the Sensi is a great option to sort of ease you into the world of smart things. The Sensi has enough smart features to give you the control you want, but it won’t leave you dumbfounded trying to figure out why your heater or AC is going crazy. The Sensi won’t try to learn your schedule or figure out when you’re home and when your house is empty. However, it will give you complete climate control of your properties at any time from anywhere. And, it will do it reliably and at half the cost of some of the fancier thermostats on the market. In most cases, you will never have to use a C wire. This is a huge benefit because now you no longer have to go to the trouble of getting a C wire and making it goes past your furnace. It is true that you don’t NEED a c-wire. But for the best experience, I recommend having one. I know I wouldn’t want to be replacing batteries every couple months and I definitely know that I want my WiFi connection to be at its best. To me, it seems like the relatively small difficulty of installing an add-a-wire solution outweighs the potential inconveniences of not doing it. Thanks for your help, Eric! Now, I know how to deal with c-wire as well as the HVAC while installing the thermostat. By the way, Emerson Sensi is also a good choice since my sister bought one for her home and had positive comments. So, I think I should have one.